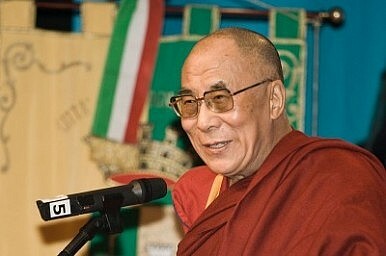 The Dalai Lama issues a firm statement saying that China should have no say in the succession issue. The Dalai Lama has outlined a timeframe for deciding whether to continue the institution of the Dalai Lama, but has said that China should have no say in who succeeds him if it does continue. ‘When I am about ninety I will consult the high Lamas of the Tibetan Buddhist traditions, the Tibetan public, and other concerned people who follow Tibetan Buddhism, and re-evaluate whether the institution of the Dalai Lama should continue or not,’ he said in a statement posted on his website today. The Dalai Lama and his followers fled China in 1959 after a failed uprising against Chinese Communist rule in the Tibetan capital Lhasa. The movement is now based in Dharamsala in India, but has been a regular thorn in the side of China, which has consistently suggested he is a separatist troublemaker. Indeed, China has frequently been keen to punish countries that are seen to be encouraging his movement. In 2008, for example, the annual China-EU talks shelved for the first time in 11 years after French President Nicolas Sarkozy met with him. Using data from the United Nations and World Bank, the authors found ‘official’ meetings between the Dalai Lama and the leadership of a country resulted in a cut in exports to China from that country of an average of 8.1 percent. This effect, the authors said, lasts about two years. In his statement, the Dalai Lama made abundantly clear he is unhappy with any such meddling by China.